The Spreader is a unique, behind-the-scenes documentary. The presentation is in the modern form of a reality show. Unlimited access gives us an inside look at the process. Broadcast quality picture and audio combine for first rate viewing. There is no narrator, at all. Instead, the actual craftsmen, that are performing the work and a cast of many others, do the descriptive explanations. Managers, consultants, suppliers and outside contractors all speak on the many events that we are viewing. 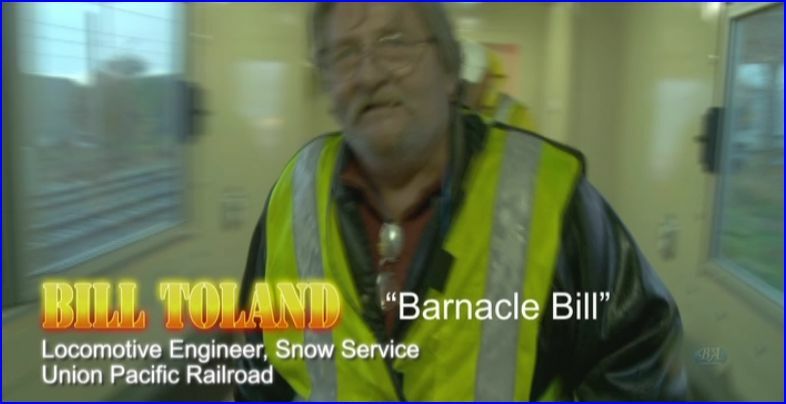 Additional railroad employees like veteran snow service engineer Bill Toland, offer even more commentary. An up to date musical soundtrack, is lively and adds to the dramatic environment. BA has a suggestion at the beginning to, Turn Up The Volume! Live audio also has running machinery and tools. 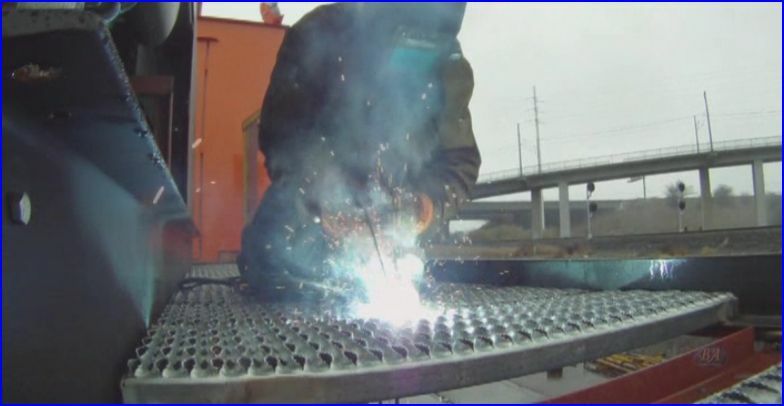 The videographer has given viewers a first class look at the project. Professionally edited and with a fast presentation, make for an enjoyable time. Here is the inside scoop. Brendan is holding the video camera and the men discuss what is happening at the time. They do all of the talking on this show. The overall effect is that you are standing along with these guys, at their workplace. They will construct, assemble, examine and problem solve on the spot. Direct and to the point, these are the actual events as they occur. Between the sights and their voices, it is hard to break away from the show. A highly engaging program, with plenty of personality. 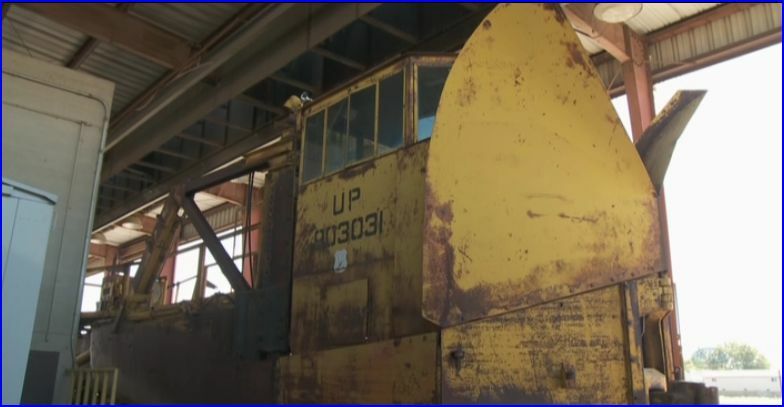 Union Pacific will take an old UP and an SP Jordan spreader and bring them into the Roseville, CA. facility. SPMW 4031 and 4032. The pair will be disassembled for complete rebuilding. An ambitious plan with a short window of time for completion. This is the first volume of what will be a two part production. 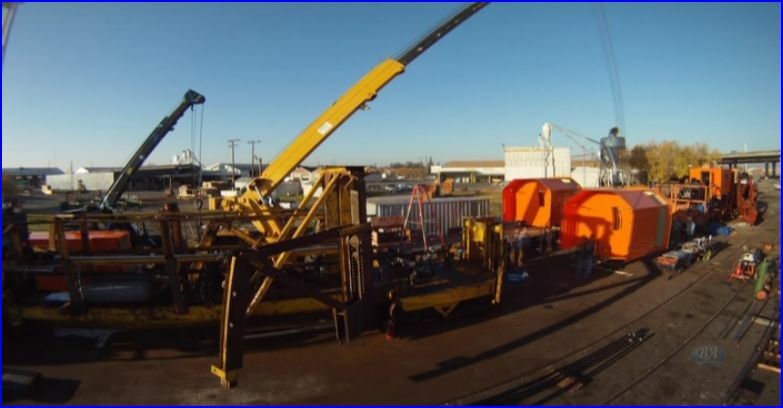 Based at Union Pacific’s Roseville facility, the entire rebuilding process will be seen.There are many updates to be installed and improve upon the original design. There are numerous modifications. These will bring the elderly spreaders into the 21st century. A parallel project, of improving tunnel clearances for double-stack trains, is also briefly included in this show. 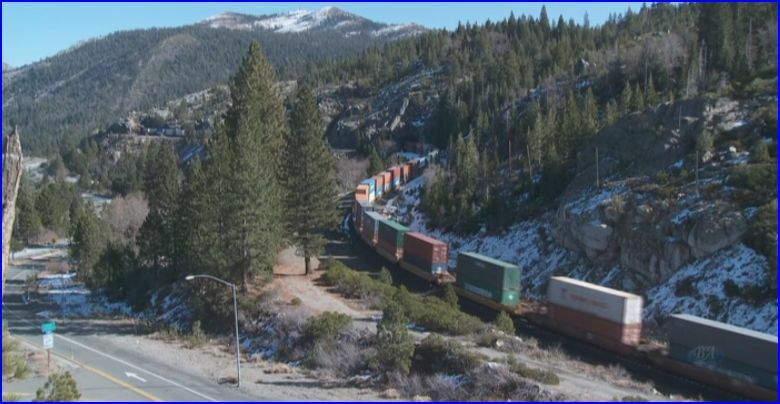 That will allow those trains to use the Sierra Nevada mainline instead of the Feather River Canyon line. There is a tight timetable. Beginning in September, 2009. The 1st target completion date is by Thanksgiving. The absolute deadline is December 31, 2009. A must, get it done date. This equates to 12 hour days, 6 days a week! Some of the work, like new cab construction must be outsourced. The tight time-frame causes this situation. As this work is performed off-premise, that can be problematic. It is fascinating to see the many skilled craftsmen perform their tasks. They will explain and comment on the work they are doing, They even describe what the goal is for that work. Everyone has an excellent ‘can do’ attitude. Sometimes, they are not seen in the best of moments. Remember, they are under pressure to get things working. So challenges of balking equipment must be corrected, on the spot. Reminds me of the old UP slogan, ‘We Can Handle It’. Total professionals. An impressive group of railroad men. 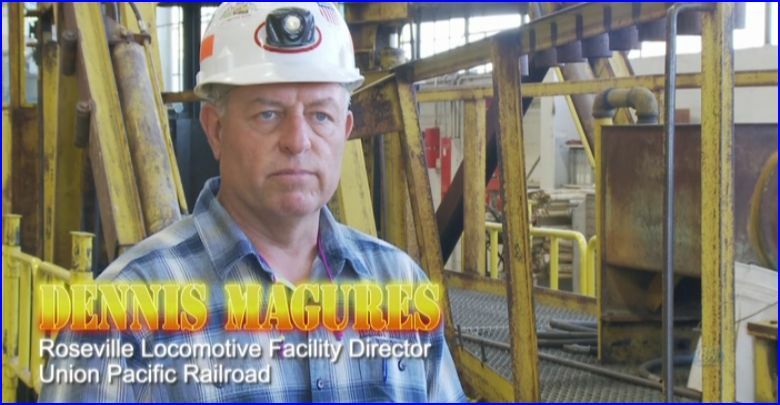 This program will have a much wider appeal than just railroad enthusiasts. All of the mechanical work that is shown, would satisfy anyone with similar interests. 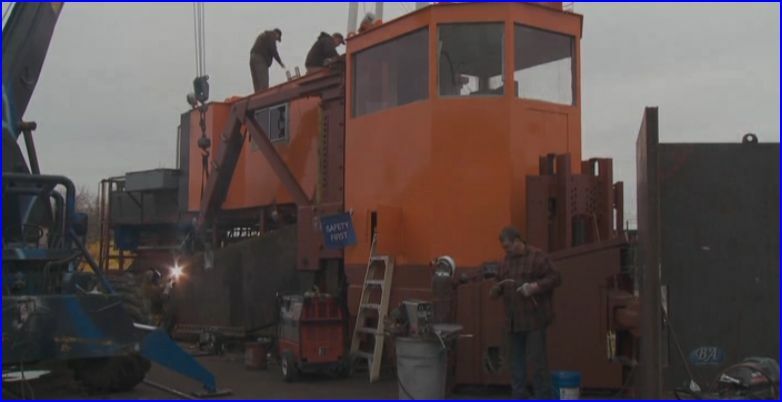 A high level of detail in brief, but effective scenes show the construction and assembly of the spreaders. There is a detailed chapter menu. A fun way to jump to your favorite parts! This is a great show to watch. A definite feeling of being there, on-site, with the informative and occasionally humorous men. Yes, they do have a few laughs. Great! After all we have been through together. Does it work? 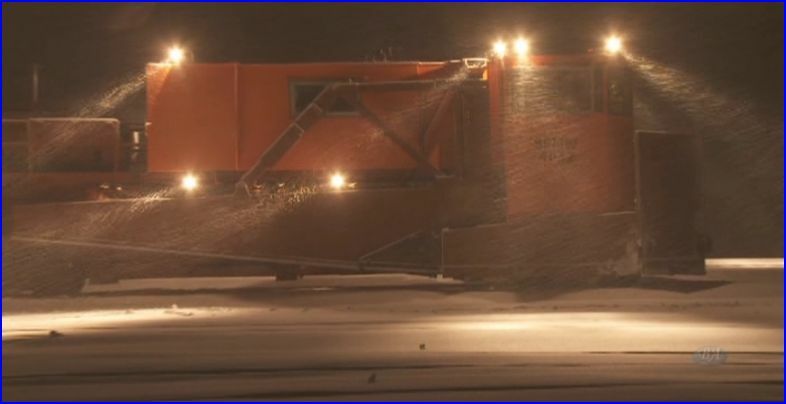 A huge snowstorm is predicted in the Sierra Nevada Mountains. A pair of UP diesels haul the reconstructed spreaders up to Truckee. 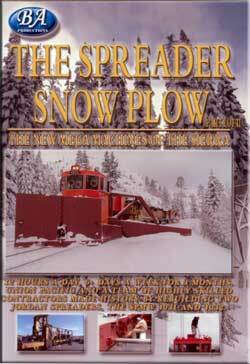 We ride in the cab of the lead spreader, as it journeys to Truckee. 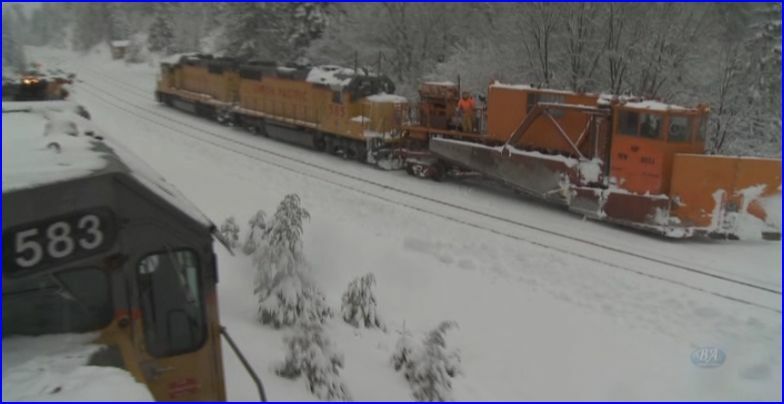 Viewed with the pair of GP38’s, those spreaders are large pieces of equipment. Arriving in a heavy snowstorm, they appear to arrive ‘just in time’. Fantastic! 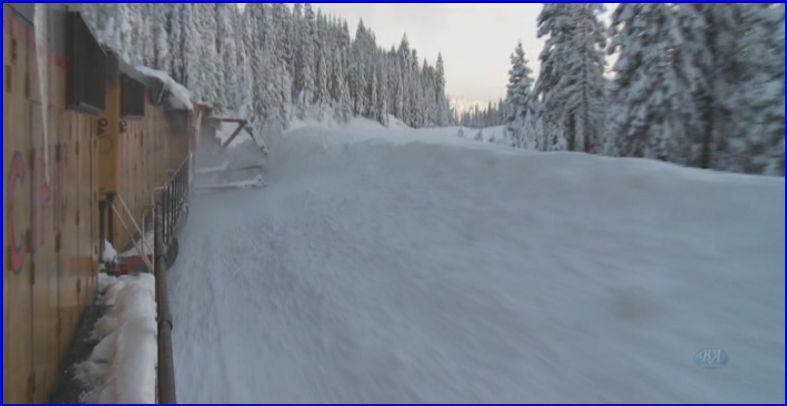 This entry was posted in ATVR Reviews, BA Productions and tagged American Train Video Reviews, California, PBS style, Southern Pacific, Train DVD, train video reviews, transportation, Union Pacific by William J. Hudson. Bookmark the permalink.